The patriotic, retractable reel comes with a belt clip hardware on the back of the reel, an American Flag imprinted logo, and a swivel hook attachment. The preprinted logo is protected by a dome-shaped plastic covering. 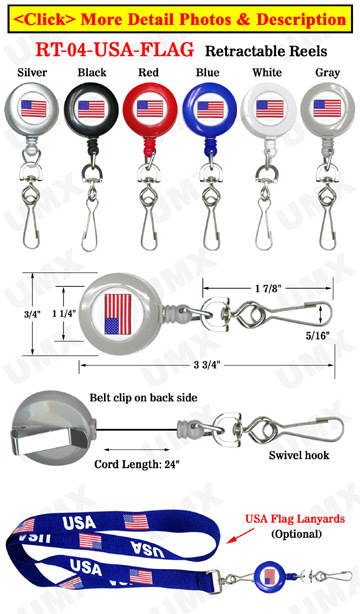 The American Flag retractable reel can be used with identification badges, small charms or keys and in conjunction with our other patriotic lanyard series products. Custom Imprint: Any custom imprint available with a minimum order of 50 pcs. Custom Hardware: A variety of custom hardware attachments, belt clips or connectors available.